I’ve seen a lot of good games coming from RPG Maker lately, despite its limitations. Echoes of Aetheria promises to be another of those good games, and possibly even break those limits. It’s from the creators of the well-received Skyborn, too, so it might just bring the goods. Does it, though? Let’s find out. Sorry, I meant to say Lucian is caught up in a drawn-out slaughter. My bad. The story starts out pretty simple. Two nations are about to make peace through a wedding ceremony, when suddenly a gas knocks everyone out, and a group of men kidnap the bride. The groom’s brother, Lucian, is somehow unaffected, and he goes off to find her, only to find that this is just the beginning of a massive conspiracy. Even as he tries to make things right, Lucian is accused of treason and eventually caught up in a drawn-out war. Naturally, with a war comes many battles, and battling is the core of Echoes of Aetheria. 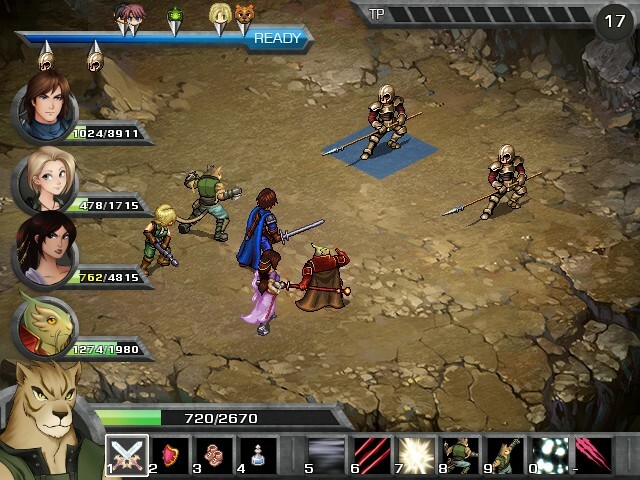 The party and enemies stand on opposite sides of a small grid, giving this RPG the barest of strategy elements. For the most part, this comes into play with area-of-effect attacks that show up later in the game. Still, each character has an impressive variety of skills to choose from, including a huge number of status effects. Your skill setup might change completely when dealing with humans, rather than robots. Although the creators tout the battle system, this game’s strong point for me is actually in the dungeons. While the different dungeons vary quite a bit, most have a few things in common. When you first enter a dungeon, there are usually a lot of blocked-off paths. You might be able to grab a few treasures, but for the most part you have a linear path at first. At the end of the path, you’ll usually find a button, a key or some item, which unlocks some of those blocked-off paths for you. Some dungeons late in the game have up to four different colors of gates, so even as you go through it the first time it’s important to pay attention, spot the places you’ll be able to go later, and mentally map the dungeon. Otherwise, you’ll almost certainly be lost by the end. To me, this was a brilliant way of making navigation a nice challenge without just throwing me into a complete maze. A slightly weaker part of this game is the item crafting system. 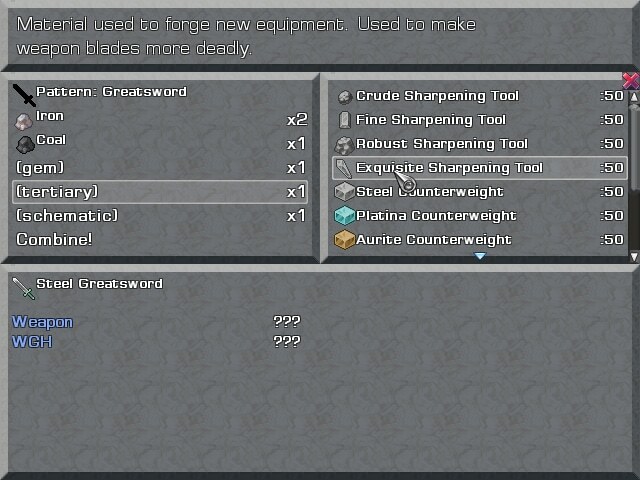 Basically, after the beginning of the game, you can’t really buy weapons or armor anymore, and you have to craft them from the materials you obtain from battle or as treasures. Every type of weapon or armor has a template, and you add some metal and a reagent to make a unique item. There are other things you can add, but those are the basics. The problem is that there’s nothing in the game to teach you this system or even ease you in, and you can never really tell what metals and reagents have to be combined. On top of that, every character can use every type of armor, but each character has a weight limit, so sometimes it’s not even worth making something better for a particular character–which I tended to find out the hard way. The story and characters are pretty spot-on for a game like this one. I didn’t expect much, and this game surprised me. The main characters are built from old tropes, but the creators have made them into something a bit more than that. Their motivations are complicated, and lead them to do things you wouldn’t expect your average RPG heroes and villains to do. Since there are only five party members, and only one or two of the villains get this much focus, each of them have been given a lot of obvious love and attention. 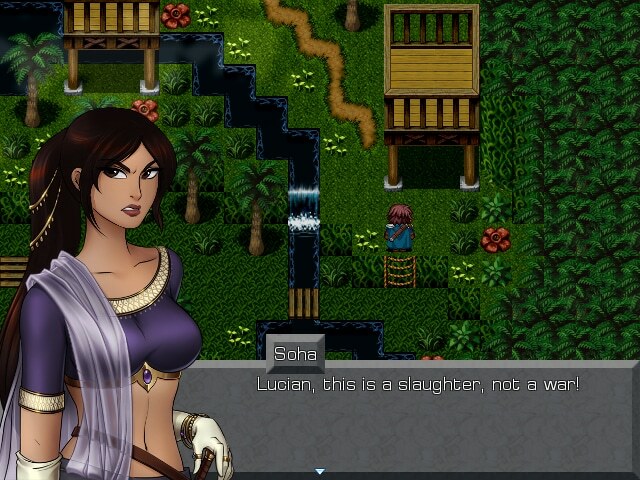 When reading Dancing Dragon’s pitch for Echoes of Aetheria, it’s clear that they wanted to break the RPG Maker mold. I would say that they’ve both succeeded and failed. For one thing, the controls are designed to give you more options than normal, including full mouse control, which is nice. 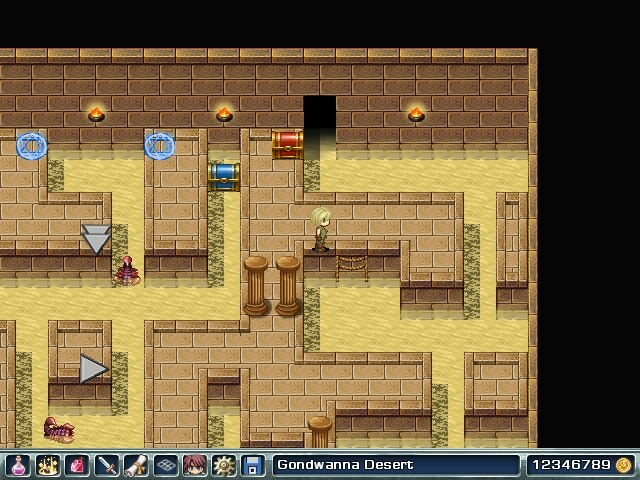 However, some of them are clunky enough that I ended up going back to the standard I know from my RPG Maker experience. More serious is the fact that in some dungeons with lots of enemies roaming around and other objects, the framerate drops considerably. 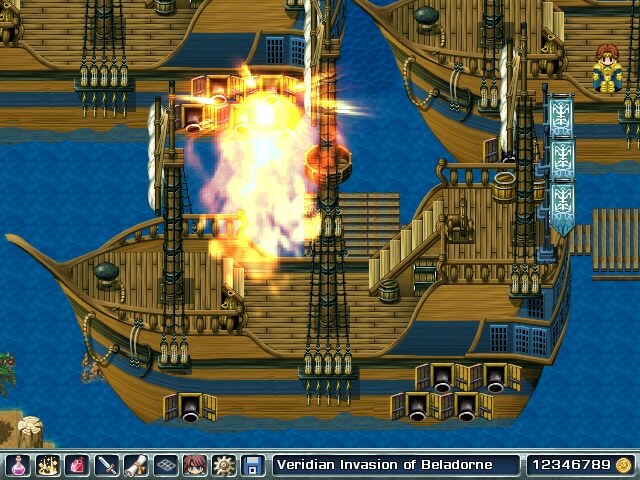 That’s a limitation of the RPG Maker VX Ace engine that even the best developers can’t get past. One other consequence of being an RPG Maker game is the graphics. 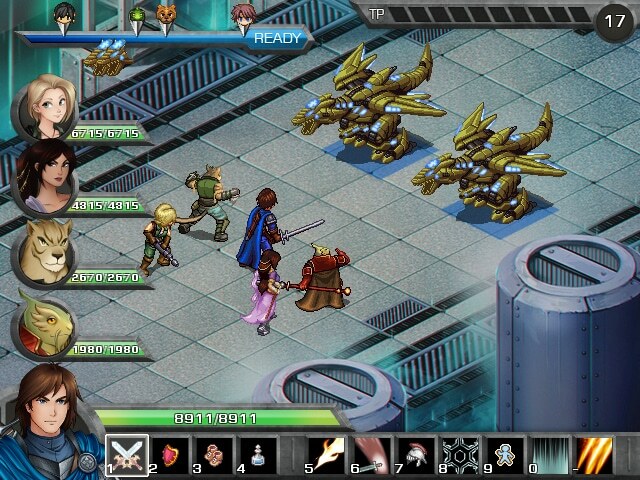 The character portraits and in-battle sprites are all original works, and they look good, but on the game field, everything looks completely RPG Maker VX Ace. Most of it is actually custom or community-made, but it is all based on and holds to the engine’s stock style very closely. That’s kind of hard to ignore, really. Also, I don’t normally complain about game resolution, especially with RPG Maker titles, but because Echoes of Aetheria seems to have such a high production value, being stuck at something like 640×480 holds it back quite a bit. Sound-wise, it’s unfortunately pretty forgettable. In fact, the only time I ever really noticed the music was in the one case where it didn’t fit the situation at all. At least the sound effects are pretty nice, reinforcing the fact that this game has its roots in older RPG’s. All told, this game took me about 20 hours to finish. I was disappointed to find that there was no New Game Plus feature at all, but then again, I had only completed it on the easiest of the three difficulty settings to begin with, so there is replay value in that sense. I wouldn’t say the game was too easy at all, so on the higher settings it probably poses quite the challenge. Echoes of Aetheria has a lot of both good and bad. The battle system is pretty good, and the level design is amazing, as is the character development. But the game is held back by minor technical issues, mediocre graphics and a less-than-great crafting system. Still, for $14.99 USD it’s certainly not a bad buy, since I would argue the story alone is worth that much. Give it a shot! Review copy supplied by the publisher. Phil N. Schipper joined the Operation Rainfall staff to review Android games, but soon fell in love with writing news articles and Games of the Past. His dream is to make a living writing sci-fi and fantasy novels, which is why he leads the Obscure Authors Alliance in his free time. Still, even in his stories, which usually involve insane people, video games are one of his strongest influences. He describes himself as "a Mr. Nice Guy with a horrible, horrible dark side."